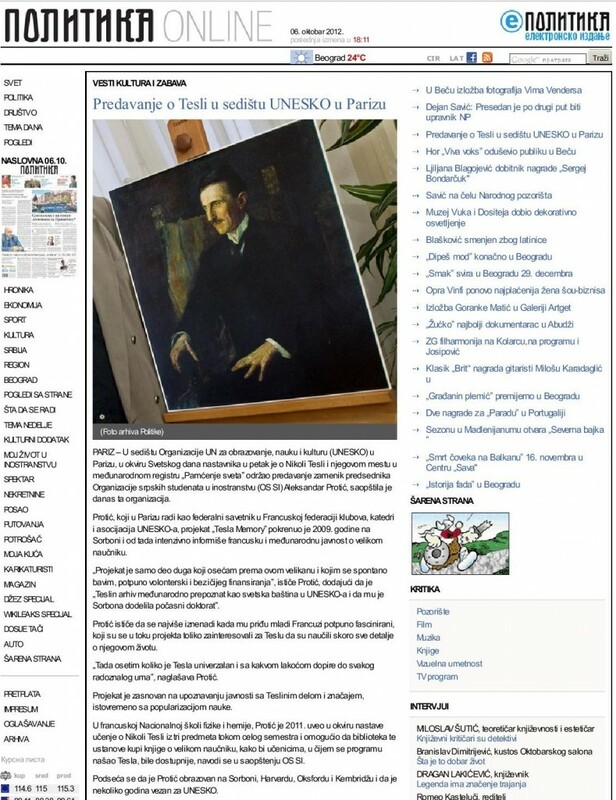 The objective of the TESLA Memory Project, initiated by Aleksandar Protic, president of UNESCO Club at Sorbonne University and the director of Intercultural Forum, is to increase awareness of UNESCO’s Memory of the World Register, global importance of science and life and work of Nikola Tesla. Nikola Tesla, one of the world’s greatest scientists, is often considered as “The Man who invented the 20th century, now shaping the 21st century”. His impact on the modern world is enormous, products of his genius can be found in everyday life. Nikola Tesla exemplifies a unifying force and inspiration for all nations in the name of peace and science. He was an authentic visionary far ahead of his contemporaries in the field of scientific development. This is why UNESCO’s Memory of the World Register consideres Tesla’s inventions archives as a heritage of mankind. This entry was posted in ACTIVITES, TESLA by CLUB UNESCO SORBONNE. Bookmark the permalink.